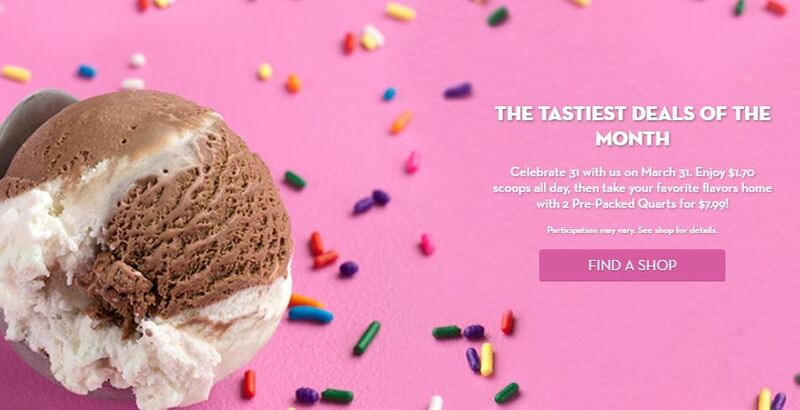 Baskin Robbin’s “Celebrate 31” offer has increased. If you’re not familiar, Baskin Robbins offers discounted scoops of Ice Cream on the 31st day of any month that has 31 days. Catchy promo right? It used to be that on the 31st of the month, you got a scoop of ice cream on a regular cone for $1.31. Which made the promo even catchier. The last time $1.31 was the price was March 2017. Then it increased to $1.50 per scoop. Less catchy of a promo since the price doesn’t correlate with the date or their signature “31 flavors”. And now, for the March 2019 “Celebrate 31 day” the price will now be $1.70 for a single scoop of ice cream. Looks like Baskin-Robbins is struggling with operating costs going up that they can’t even spare the extra $.39 off a scoop of ice cream that they could just 2 years ago.